... To TheDigginItShop.com, the online home of Diggin' It in McKinney, Texas! Here you can catch up on the latest Diggin' It news, classes, events, and merch. Come see us! 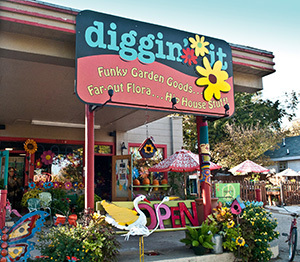 Diggin' It is a hip garden, home, and art shop located near the main square in historic downtown McKinney, Texas. Drop by from around 10:00am - 5:00pm Tuesday-Saturday to browse through an eclectic selection of far-out flora, funky garden goods, hip house stuff and MORE - all located in a former Greyhound bus station and yard that has been renovated and refunkified. We look forward to seeing you browsing the shelves, signing up for our new set of classes taught by local artists, crafters, and more, or just hangin.' Peace out, man.